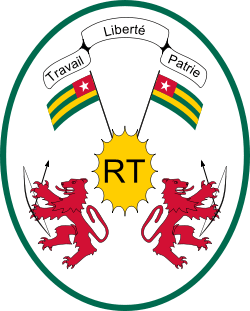 The Military of Togo, in French FAT (Forces armées togolaises, "Togolese armed forces"), consists of the army, navy, air force, and gendarmerie. Total military expenditure during the fiscal year of 2005 was 1.6% of the country's GDP. Military bases exist in Lomé, Temedja, Kara, Niamtougou, and Dapaong. The current Chief of the General Staff is Brigadier General Titikpina Atcha Mohamed, who took office on May 19, 2009. The current chief of staff of the army is Colonel Blakimwé Wiyao Balli. Engesa EE-9 Cascavel - between 3 and 36. The Togolese Air Force (French: Armée de l'Air Togolaise) was established in 1964, and a French influence remains on the choice of aircraft used. Since 2005, the air force's chief of staff is Colonel Bouraïma Bonfoh. The C-47 Skytrain was the first aircraft used; it was part of the force from 1960 to 1976. Replacing the C-47s were two DHC-5D Buffalo STOL transports in 1976. Also in the same year Togo acquired five ex-German Air Force Fouga Magister armed jet trainers and seven EMB.326GBs from Brazil to form the Escadrille de Chasse. Togo's armed jet trainer fleet was upgraded in 1981 by the deliveries of five Alpha jets and by three piston engine Aerospatiale TB-30 Epsilons in 1986. The Fouga Magisters were returned to France in 1985. 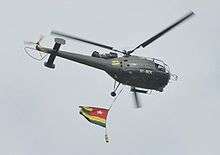 During its existence the official name changed from Section Air der Forces armées Togolais in 1964 to Escadrille Nationale Togolaise in 1973, to Groupement Aerienne Togolaise (GAT) in 1980, and finally to Armée de l'Air Togolaise in 1997. At present its operations are concentrated to the Base Transport de Lomé (Lomé Transport Base) at Lomé Tokoin Airport, where the transport aircraft are based, and the Base Chasse Niamtougou (Niamtougou Fighter Base) at Niamtougou International Airport, where the combat units are located. The Togolese navy (French: Marine Togolaise) was created on May 1, 1976 to guard the roughly 55 kilometers of Togolese coast and the seaport of Lomé. It currently has 2 wooden-hulled patrol boats, the Kara (P 761), and the Mono (P 762), which have both been in service since 1976. On 7 July 2014, the Togolese navy got a RPB 33 patrol boat that was named Agou (P 763). Currently, the navy's chief of staff is ship captain Atiogbé Ametsipe. 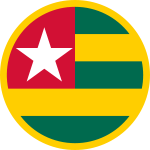 1 2 3 4 5 "Togolese Military". cia.gov. 2010. Retrieved 12 December 2014. ↑ "CIA World Factbook". www.cia.gov. Retrieved 2011-04-15. ↑ "Organisation des Forces Armées". www.forcesarmees.tg. Retrieved 2011-04-15. ↑ "Un Nouveau Chef à la Tête des FAT". www.forcesarmees.tg. Retrieved 2011-04-16. ↑ "Le Chef d'Etat Major de l'armée de terre". www.forcesarmees.tg. Retrieved 2011-04-15. 1 2 3 4 5 6 7 8 9 "Togolese Army". www.armyrecognition.com. Retrieved 2011-04-05. 1 2 3 4 5 "Arms Trade Register". SIPRI. Retrieved 22 June 2012. ↑ "Le Chef d'Etat Major de l'Armée de l'Air". www.forcesarmees.tg. Retrieved 2011-04-15. ↑ "Historique de l'Armée de l'Air". www.forcesarmees.tg. Retrieved 31 August 2014. ↑ "Les bases de l'Armée de l'Air". www.forcesarmees.tg. Retrieved 2011-04-15. ↑ "Organisation de l'Armée de l'Air". www.forcesarmees.tg. Retrieved 31 August 2014. 1 2 3 4 "World Air Forces 2015 pg. 31". Flightglobal Insight. 2015. Retrieved 1 June 2015. ↑ "Marine". www.forcesarmees.tg. Retrieved 2011-04-16. ↑ Wertheim, Eric (2007). The Naval Institute Guide to Combat Fleets of the World: Their Ships, Aircraft, and Systems. Annapolis, MD: Naval Institute Press. p. 787. ISBN 9781591149552. Retrieved 18 March 2014. ↑ "Togo gets third defender patrol boat". IHS Jane's 360. 7 July 2014. Retrieved 31 August 2014. ↑ "Le Chef d'Etat Major de l'armée de la Marine". www.forcesarmees.tg. Retrieved 2011-04-16.